eBay will soon be implementing the requirement to have a barcode assigned to your product should you wish to list it as for sale on eBay. 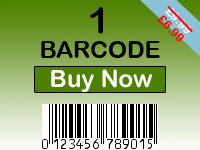 A barcode number (or EAN Number) is a unique 13 digit product identification number. A UPC barcode number is a 12 digit code. If you need a barcodes for eBay then you have come to the right place.